Almost all the food bloggers in Penang have posted about Kang Beef House steamboat. Curious, we head to Kang Beef House for lunch today after our Cheng Beng. We are tired, not so hungry after stuffing ourselves with the roasted pork at the graveyard but we are very thirsty. So, I probably won’t be raving over it much because of these factors. It is still early and we are probably the second or third customers. So, the soup is probably not full flavoured yet. 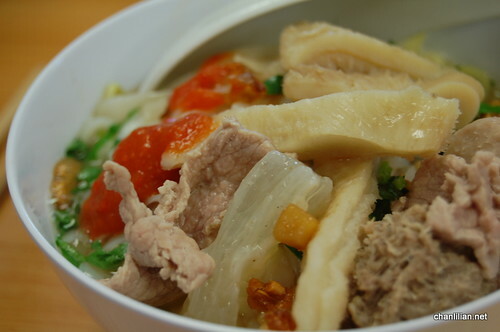 The secret to enjoying a good bowl of beef noodle or beef soup is to go towards the end when all the bones and meats have imparted their flavours in the soup. But then, famous stalls probably have sold out most items by then. Unfortunately, the only available edible thing on the menu at that hour (before 12 noon) was beef noodles or beef soup only. No other dishes are available, not even the steamboat, because the sifu only works at dinner time. So, we ordered a claypot beef soup for four persons (RM28) and three bowls of mee/koay teow and rice. Kang Beef House passed my ‘standard’ of a good beef koay teow. 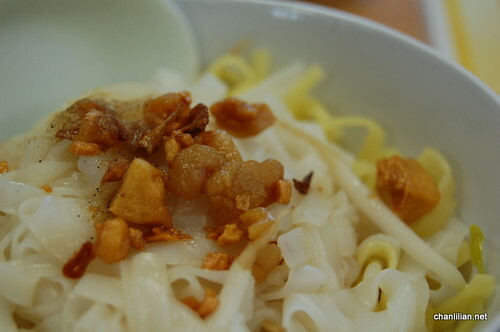 They have nice chillies sauce, plenty of tendons and tripes, soup that is mild and yet, leaves a pleasant and satisfying taste and the noodles is special. They don’t use the regular yellow noodle but flat yellow noodles. However, my hubby and kids found the soup too ‘clear’ and not flavourful enough. The reason is because they do not like chillies sauce. Normally, I will pour in two persons’ portion of chillies sauce into my own bowl, add the soup and the meat and enjoy my koay teow-mee in a red, muddy bowl of soup. It is THE way to enjoy beef koay teow. Other people may say me, “Siao eh, may as well go drink chillies sauce soup….” Oh ya, don’t forget the extra portion of coriander leaves and lard pieces too. 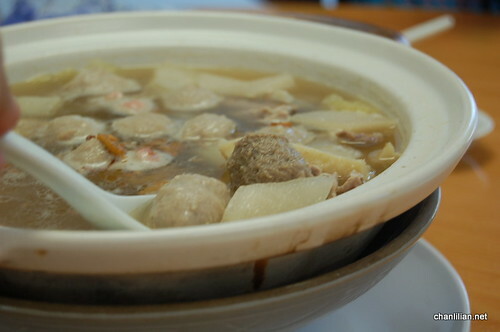 The soup in Kang Beef House has white radish and thinly sliced salted vege (kiam chye). 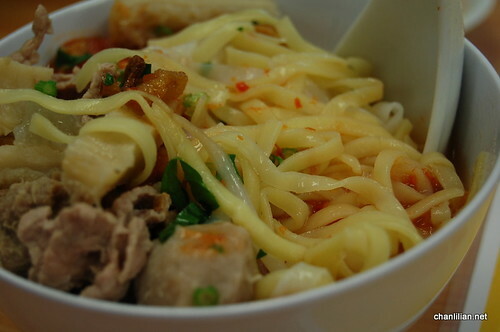 That’s why the soup seems to taste different from other beef koay teow stalls. I like Kang but I prefer the 2828 Cafe at Jalan Perak more. Where is Kang Beef House? Well, just enter the Perak Road from Jalan Jelutong and you can see it right smack on the right side the moment you turned into Perak Road. Bright yellow sign you won’t miss. I encourage you to Google Kang Beef House and read the other bloggers’ reviews. They may get you salivating as they had sampled more dishes than I did. We too support you on the 2828 Beef Koay Teow. They are actually from the same family tree! 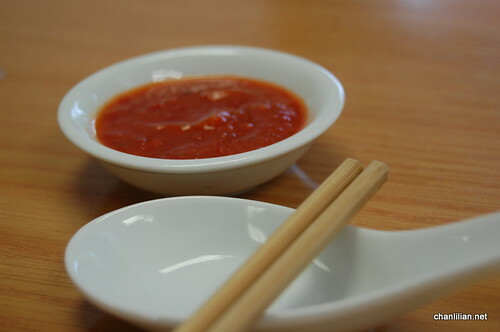 As for the chili sauce it is nice, but we tend to mix it with lard bits and lard oil before we dip anything into it. See our belly good you will know that we are siao bak yew wan! Yes, the LARDS. Never miss those ….